- Gold price climbed higher toward $1325 before starting a correction against the US Dollar. - There is a major descending channel forming with resistance at $1315 on the hourly chart of gold versus the USD. - Recently in China, the Consumer Price Index for Dec 2017 was released by the National Bureau of Statistics of China. - The outcome was below the forecast of +1.9% as there was a rise in the index by 1.8% (YoY). Recently in China, the Consumer Price Index for Dec 2017 was released by the National Bureau of Statistics of China. The market was positioned for a rise of 1.9% in the CPI in Dec 2017 compared with the same month a year ago. The actual result was below the forecast of +1.9% as there was a rise in the index by 1.8%, but it was better than the last 1.7%. In terms of the monthly change, there was a rise of 0.3% in Dec 2017, which was lower than the forecast of 0.4%, but more than the last 0%. Overall, gold price might correct a few pips in the short term, but it is likely to extend declines toward $1300 in the near term. 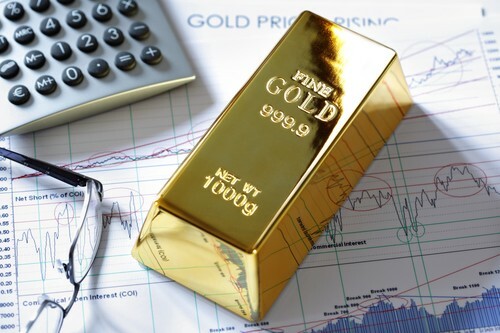 Recently, we saw a major upside move in gold price above the $1300 level against the US Dollar. The price gained a lot of momentum, settled above $1300 and traded towards the $1325 level where it faced sellers. The price is now well below the $1315 level and the 100 hourly simple moving average. There was also a break below the 76.4% Fib retracement level of the last wave from the $1305 low to $1325 high. At the moment, it seems like there is a major descending channel forming with resistance at $1315 on the hourly chart of gold versus the USD. On the downside, the price could accelerate declines and it could even trade towards the 1.236 Fib extension of the last wave from the $1305 low to $1325 high, which is near $1305. On the upside, any recovery is likely to face a strong selling interest near $1315 and $1320.